Chinese demand for high quality fruit remains strong and imports of apples and pears are expected to increased in MY 2018/19. Demand for imported table grapes is also strong, but imports will decrease due to a constrained supply. 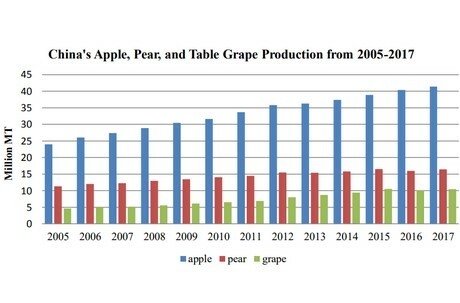 As long as additional Chinese tariffs are in place on U.S.-origin products, U.S. apples, pears, and table grapes are expected to lose market share. Extreme weather this spring across northern China will result in a sharp fall of the country’s apple, pear, and table grape production in MY 2018/19. Apple production is forecast to fall 25 percent to 31 million metric tons (MMT), pears 20 percent to 13 MMT, and table grapes 10 percent to 945,000 metric tons. 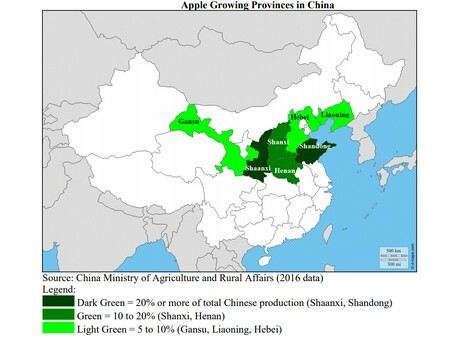 China’s MY 2018/19 (July-June) apple production is forecast down to 31 million metric tons (MMT), a roughly 25-percent decrease from the revised production number in the previous year. In early April, a severe frost struck the major apple-producing provinces in north-west China, including Shaanxi, Gansu, and Shanxi Provinces. This greatly affected the apple crop blossom. As a result, Shaanxi Province, the leading apple producing province, is expected to produce 20-30 percent less apples than last year. Furthermore, apple production in Shanxi and Gansu Provinces will likely decrease by 30-50 percent. Although the frost damage on the Shandong apple crop, China’s second largest apple producing province, was not serious, heavy rainfall and hail storms in May will likely cause apple production to fall by 15 percent from the previous year. Liaoning and Henan Provinces enjoyed mild weather and are expecting normal to bumper harvests. The bad weather also affected the quality of apples (smaller sizes, for example), particularly in the chillier northwest producing areas. Although heavy rains caused some occurrences of fruit russeting disease, the overall apple quality is quite good in Shandong Province.